UK Foreign Secretary David Miliband has warned Russia against hankering after a Soviet past in its border disputes. He told the BBC Russia had been trying to assert the concept of "ex-Soviet space", which was "not acceptable". Russia had adopted a 19th Century approach and "blatant aggression" in Georgia, when it should be asserting itself economically, he said. EU foreign ministers are meeting to try to co-ordinate an international response to the crisis in Georgia. 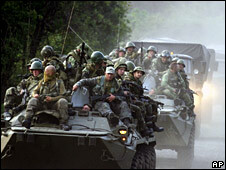 Russian and Georgian troops have been fighting over the breakaway Georgian province of South Ossetia. But Mr Miliband told BBC Radio 4's Today programme there had been "blatant aggression" by Russia outside South Ossetia, in Abkhazia and into parts of Georgia. "The sight of Russian tanks rolling into part of a sovereign country on its neighbouring borders will have brought a chill to the spine of many people, rightly, because that is a reversion to - it's not just Cold War politics, it's a 19th Century way of doing politics." He added: "That is simply not the way international relations can be run in the 21st Century." Mr Miliband was speaking as it appeared French President Nicholas Sarkozy had agreed an outline plan with Russia and Georgia to try to resolve the crisis. The foreign secretary said there should be a retreat back to pre-7 August positions, pending international engagement "on the security and stability of the area, consistent with the territorial integrity of Georgia". "Countries need to know that their territorial integrity is secure," he said. He told the BBC that on the Georgia issue, and other disputed border areas, "the Russians want to assert this concept, I think, of 'ex-Soviet space', somehow denying that these are independent countries with territorial integrity of their own. I think that is unacceptable." He added: "It's not good for Russia to continue to believe that it is suffering a hangover from the collapse of the Soviet Union. The Soviet Union does not exist anymore. There's no such thing as ex-Soviet space." He said the "new map" of eastern Europe had to be defended in the interests of stability and it was in Russia's interests to do so. "Russia knows that its strength in the 21st Century is going to have to be asserted economically and not just militarily, but we have got to make sure that this remains absolutely clear," he told the BBC. He said countries on Russia's borders needed to know their territorial integrity was secure. "It's not in Russia's interests to continue to hanker for a Soviet past because frankly, it's gone and it's good that it's gone." Speaking to the programme later Andrei Chupin, Russia's charge d'affaires in London, said he believed the British media had favoured Georgia's position in its reporting of hostilities. Russia has insisted that it had the legal right to move in to protect Russian peacekeepers who had come under fire and to protect its citizens in South Ossetia. "We are quite disappointed with what we see as a somewhat biased coverage of the events in South Ossetia by western media," he said. Mr Miliband was also asked about an article he wrote last month which prompted speculation that he might challenge Prime Minister Gordon Brown for the Labour Party leadership. He defended the article, saying it "set out a very clear agenda" for the government, but said he had been working "very closely" with Mr Brown on the situation in Georgia and praised him for "leading the government forward with vigour and determination". "I am fully focused on dealing with the situation in Georgia. I am working very closely with Gordon on that. End of story," he said.